Over the last couple of months, I have asked a lot of questions on the TFL Forum about Dux Britanniarum ruleset, the members of the Forum were very helpful, so I thought I would place what I have found in one place. Fate Cards: When a noble is activated he can use the Fate cards of either suit. The suited cards can not be played otherwise. The bonus of playing a suited cards is that it adds +1D6 to the combat D6 total if the Carpe Diem card is played. The unsuited cards can be played anytime ie. as an offense or defense. 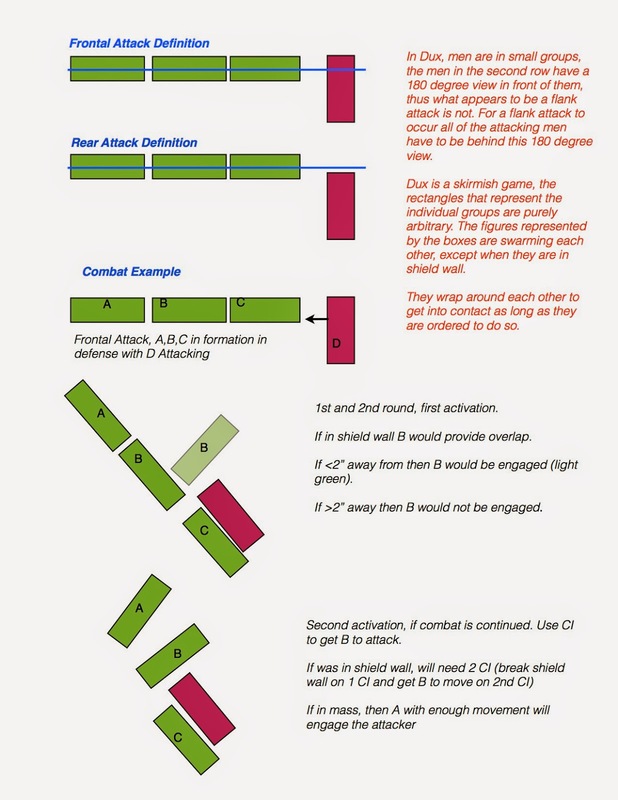 Cards used in combat modify only the first round of combat. When using a CI to buy a card you do not have to exchange a card, but at the end of your turn you can only have 5 cards. EVADE Card: Evade facing away from the enemy maintaing formation (a common house rule is that a shieldwall would would break and evade in a mass formation. Playing a Carpe Diem counters use of this card. Only Lords can command other Nobles groups. When attached to a group and leading a combat the noble can only issue commands to groups within 3” and only rally shock off group to whom he is attached. If attached at the rear then normal command rules apply. Captured Nobles do not cause a morale test, only the Lord. Killed Champions pre-battle do not cause a morale test. Activation: In respect to movement and going into formation, it can be done with one activation but cost 1D6 in movement. Movement: Unless the group is moving up to a certain point (to include terrain features or joining another group), the full distance has to be taken from the throw of the D6. Nobles Movement: Move for free when attached to group, otherwise costs 1 Activation. Attaching and Detaching Nobles: Is at no cost and can be carried out twice in a single activation. Does require CI for movement to attach. Movement through Varying Terrain: No hard and fast rule but Rich Clarke suggests the following; Imagine the obstacle is some boggy ground which reduces movement by one pip per dice. That ground is 5" away from your unit. You roll 4, 2 and 6. I'd let you move 4" with the first dice as you can move that full distance without getting into the bog, but then the 2 and the 6 are both reduced. Movement through Unbarred Doors and Gates: Costs 1d6. Facing: A group can move in any direction without cost. It just moves in that direction, it can turn around etc, with no cost. But at the end of movement it ends up facing in that direction. If the group then wants to change facing or go into an allround stance then 1D6 is subtracted from the movement. Champion: Is attached to the Lord, if the Lord joins a group for combat the Champion does as well. He can not act independently. Groups in Buildings: Do not offer support to other groups outside of buildings. Test for morale when it happens not when group leaving the table. Moves facing away unlike a routed group that moves facing the enemy. If Saxons fail raid then British awarded 2 points. If British fail morale then Saxons get two points. Throwing a 1 on a looting tests means that building is empty in raids with multiple buildings, forcing the Saxon to move on to the next building. If routing and contact enemy group or formation the routing group is destroyed. In combat throw for hits, then assign the hits equally to each group. 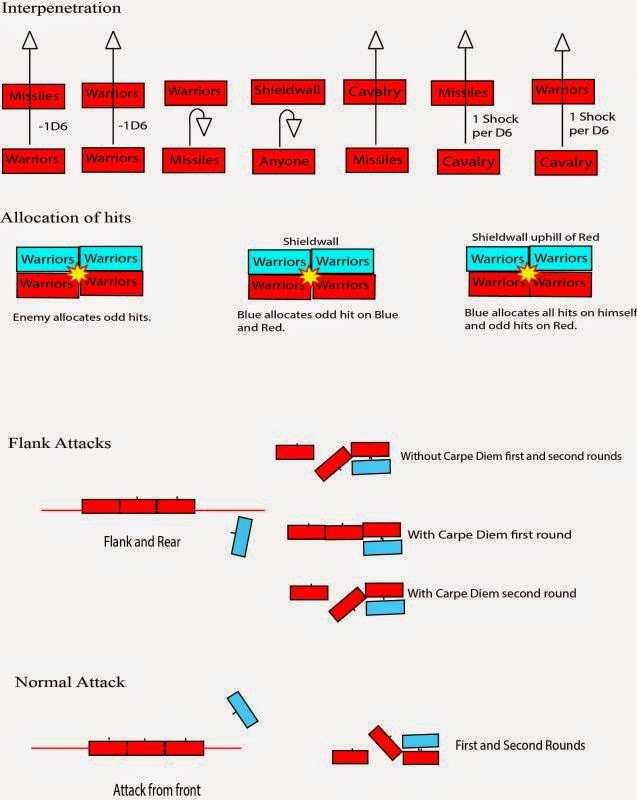 If there are an odd number of hits the attacker assigns them unless the defender is in shield wall or up hill. To win the campaign the Britons have to regain a lost province. In the career paths, each step has to completed before going to the next. Ransom Rule: A player can ransom back a captured noble, throw a d6 =>4 then 2 gold otherwise 1 gold. The player then gets to add a card for this noble to the card deck. These clarify some of the issues I had when I tried Dux Brit. Unlike you I didn't seek explanation from other sources to clarify things that (to my mind) should have been explained more clearly in the initial rules, so I moved on to other sets. Glad you're enjoying your games. Thanks Tom, the rules were tough to interpret but well worth playing. This is really good, John. I leave the burden of DB rules clarification on my opponent Hugh. That's lazy of me and I'm going to print this. Thanks Monty, I hope I have it all correct. Althoug I play exclusively Napoleonic, I am always looking for good rule-sets with playable mechanisms, so thanks for sharing! The mechanisms are very playable, but sometimes a bit obscure from the book.